Figure 7.14 Ball and cylindrical powder. 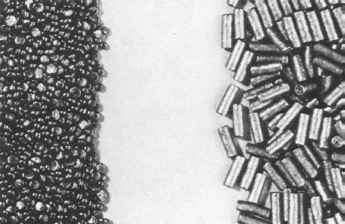 of powder are used in centerfire rifles cartridges manufactured in the U.S.: ball and cylindrical powder (Figure 7.14). A series of tests were carried out by the author on anesthetized rabbits. The chest and abdomen were shaved and the remaining hair was removed by depilatory cream. The rabbits were shot in the chest and abdomen at varying distances, using a Winchester Model 94 .30-30 rifle and a Remington 788, caliber .223, with a 24-inch barrel. Two brands of ammunition were used in each rifle. One was loaded with cylindrical powder, and the other had ball powder. The tests indicated that the maximum range at which powder tattooing occurs is different for the different forms of powder. For the .30-30 rifle, cartridges loaded with cylindrical powder produced heavy powder tattooing with deposition of soot at a range of 6 in. (15 cm). By 12 in. (30 cm) only a few scattered powder tattoo marks were present. No tattooing occurred at 18 or 24 in. (45 or 60 cm). Powder tattooing with ball powder extended out to 30 in. (75 cm), at which range it was present in moderate density. At a range of 36 in. (90 cm), ball powder no longer produced any tattooing (Table 7.3). For the .223 rifle, cartridges loaded with cylindrical powder produced rare tattooing out to 12 in. (30 cm). By 18 in. (45 cm), no powder tattooing was present. Powder tattooing caused by ball powder was heavy at 18 in. (45 cm); scattered at 36 in. (90 cm) and absent at 42 in. (105 cm) (Table 7.3). The skin of rabbits is thinner andmoredelicatethanthatof humans. Therefore, powder tattooing should theoreticallyoccurout to greatermaxi-mum distances for rabbits than for humans. Thus, thedataprovided bythese experiments should be considered onlyasaguide tothe extrememaximum distances at which powder tattooing can occur. a - = not tested. 0 = no tattooing. + = rare tattoo marks. ++ = moderate tattooing. +++ = dense tattooing. aerodynamic form than a cylinder. Ball powder grains can travel farther with greater velocity, enabling them to mark the skin at a greater range. Powder tattoo marks produced by these two different forms of powder have different appearances. The marks from ball powder are abundant and tend to be small, circular, and hemorrhagic (Figure 7.15A). Marks produced by cylindrical powder are larger, more irregular in shape and size, and relatively sparse in number compared with ball powder tattooing. Some markings have a linear configuration (Figure 7.15B). In tests, the number of tattoo marks from cylindrical powder at 6 in. was less than the number at 24 in. for ball powder. Because rifles have long barrels, there is always the theoretical possibility that by pure chance a cartridge will be loaded with powder whose burning properties exactly match the length of the barrel. In such a case, essentially no unburnt powder will exit the muzzle. The author knows of only one case in which this situation occurred. * The weapon was a 30-06 Remington 760 pump-action rifle with a 22-inch barrel; the ammunition Remington 220 gr. Core-Lokt® loaded with cylindrical powder. On firing the weapon at a target six inches from the muzzle, no powder particles impacted the target material, though there was deposition of soot and some amorphous black residue. On firing a cartridge loaded with a 125-gr. 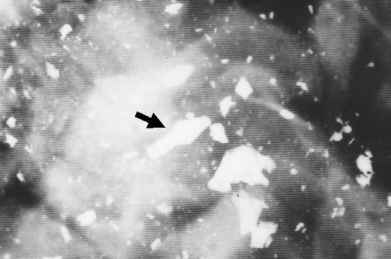 bullet and cylindrical powder, grains of powder were deposited on the target as expected. * Personal communication with Robert J. Shem.